The common misconception, created by most big box home improvement stores, is that installing epoxy is a simple process. “Just roll it on an sprinkle a few chips in it and it will last a lifetime”, they tell you. It’s not that simple, and Im going to try to explain why. What’s the difference between store-bought epoxy and professionally installed epoxy? 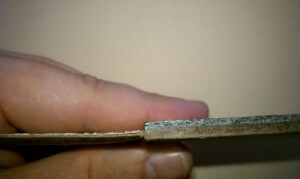 DIY Consumer grade epoxy is thin. Consumer grade epoxy is a water-based material that is usually around 50% solid, which means that half of the product evaporates into the air. When you roll this product onto the floor, after it cures, it leaves behind a very thin coating on the floor. Most of these generic consumer epoxies even go so far as to claim that one gallon will cover a 1 car garage. Assuming that a 1 car garage is around 400 feet, that means that the coating would only be 2.4 mils thick… which translates to 2.4 thousandths of an inch. They also recommend a top coat of epoxy, which means the entire finished floor is around 5 mils thick. Our 100% solids epoxy goes down around 10 mils thick for the first coat, and 15 mils for the second coat. Then we apply a third coat of urethane. What this all means is that when our entire epoxy system has been installed, the chemicals (epoxys & urethanes) go down approximately 5 times thicker than consumer grade epoxy systems. The most noticeable difference when you compare our process to the DIY hardware store system is in the quantity of chips. A typical DIY epoxy kit comes with 8 ounces of chips. The container is about the size of a Pepsi can. Homeowners are expected to broadcast a cup of chips evenly across an entire garage. It’s nearly impossible to achieve an even look on the floor with such a small quantity. Home owners don’t usually have the special spiked shoes, so they are tasked with rolling epoxy and stopping to occasionally broadcast chips at the same time. It’s an impossible task because like I said before, once you mix the epoxy, the clock is ticking. On a typical 500 square foot garage, we usually broadcast somewhere around 150-200 pounds of chips. We are able to broadcast this many chips at the end because we walk around on the epoxy with spiked shoes. Instead of trying to apply 8 ounces of chips evenly, we are able to completely cover the floor in chips (referred to as “broadcasting to rejection”), and then we just vacuum up any excess after the epoxy cures. You can’t just roll on epoxy. Epoxies are not like regular paint. You don’t just open the can and roll it on. Epoxy is sold as a 2 part mix. One part contains the resin, and the other part contains the hardener. You have to mix these two parts together to get the epoxy ready to apply on the garage floor. Once the epoxy has been mixed, you have a very small window of time to get the epoxy out of the can and rolled out on the floor. I can’t tell you how many times I’ve gotten calls from homeowners who ask me how we get the epoxy rolled out on the floor before it gets hard. How is it possible to roll a 500 square foot garage in 15-20 minutes? For an in-experienced homeowner with a paint pan, it’s impossible. It takes an entire crew to apply epoxy to a garage floor coating. 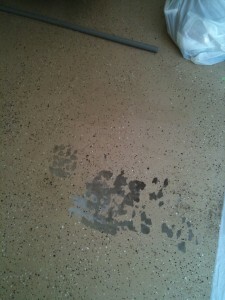 •One person’s sole job is to mix the epoxy, and keep the surrounding area clean. •One or two people are responsible for troweling the epoxy across the floor. Our epoxy is 100% solid, so you can’t just roll it on because its thick like honey. •One or two people are responsible for rolling over the epoxy after it has been spread on the garage floor. They walk on the wet epoxy with special cleated shoes. All of this can be hard to follow, so we created a video showing you exactly how we install epoxy garage floors. If you have any questions, please leave a comment, or contact us for more information. Do you have a sole distributor at Jakarta,Indonesia or other asia nation? I looking forward to know about your polished concrete. Solid article, you hit on all of the major points as to why epoxy is not a DIY project except for the prep. Most DIY kits will recommend acid washing as the prep method although this type of prep is not recommended by any manufacturer. Diamond grinding is the prferred method for preparing concrete and most home owners will not know how to do it or be willing to incur the expense of renting the right equipment. Do the flakes help with traction or just for decorative purposes? The flakes help with traction. We can add grit for traction to epoxy floors that don’t have flakes.